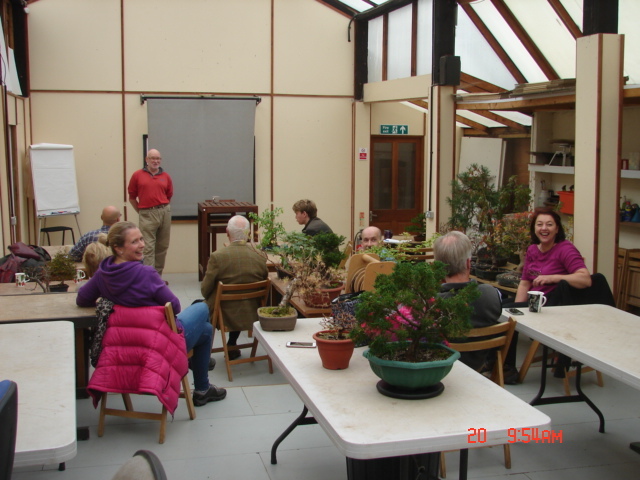 We had ten participants booked in for the tenth monthly workshop of the year here at Willowbog Bonsai yesterday, Saturday 20th October. In the event two folk were unable to attend but we still had quite a busy day. 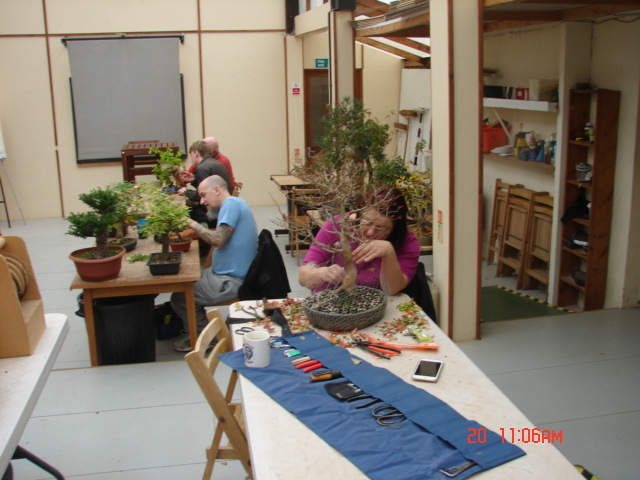 There were three participants taking part in their first ever bonsai workshop as well as Kate, who makes the long drive down from Edinburgh when she can manage it, and four Willowboggers who hardly ever miss a workshop. Following the normal discussion session it was down to work on the interesting and wide ranging examples of trees brought along to the workshop. 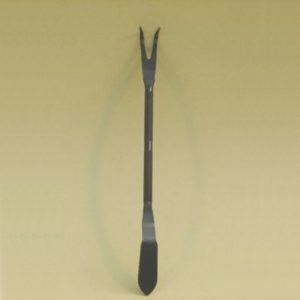 As usual I was fortunate to have the valuable assistance on the day of a couple of other Willowboggers. 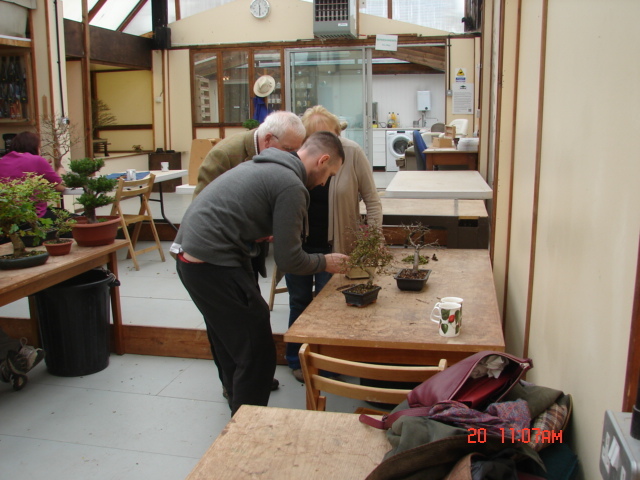 Here young Scott helps husband and wife couple Anne and Christopher with their small collection of bonsai. 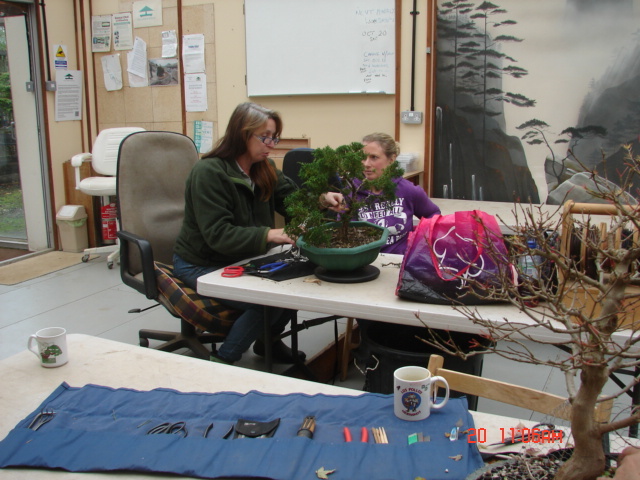 And the familiar figure of Caz in this photo helping Kate with a juniper bit of raw material and setting it on a bonsai path. 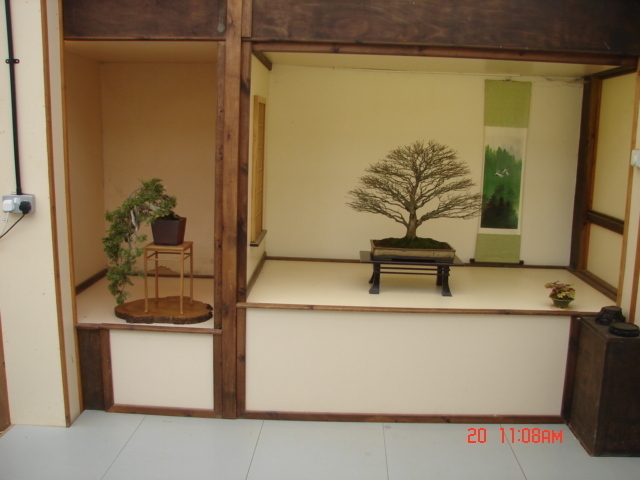 Meanwhile I helped Mathew with his first bonsai, an indoor example that we hope might get him started with ” real ” outdoor bonsai in the future. 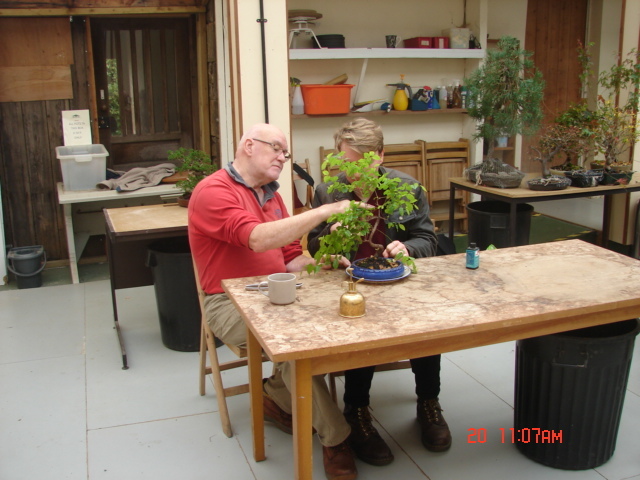 Regular Gary gets started on one of his projects for the day, a shohin size Escallonia that he air-layered from a large plant in his garden, it is going to make a nice little bonsai. 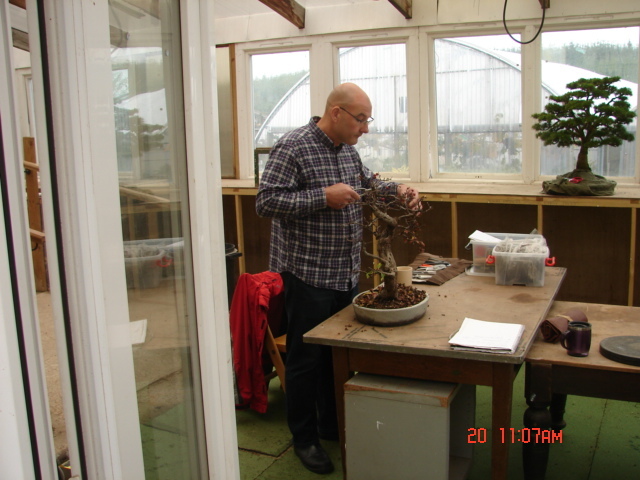 As is often the case we find Willowbogger Antony working quietly away in the adjoining greenhouse, a tidy up for his nicely developing Common Hawthorn. 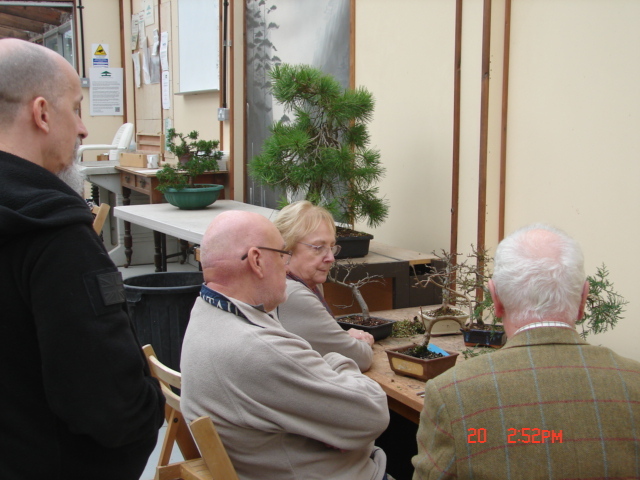 Although we do not get to see an image of Peter G. as he was taking all these photos and my thanks to him for that, we can see one of his bonsai, on the bench behind Antony is the G-man’s very nice, ex Len Gilbert, Cedar of Lebanon. My turn to have a chat with Anne and Christopher about a couple of new purchases for their burgeoning collection, a Ginkgo and a Juniper. Caz is here having a chat with Willowbgger Angela about a maple that she plans to thread graft with Peter Warren next spring. 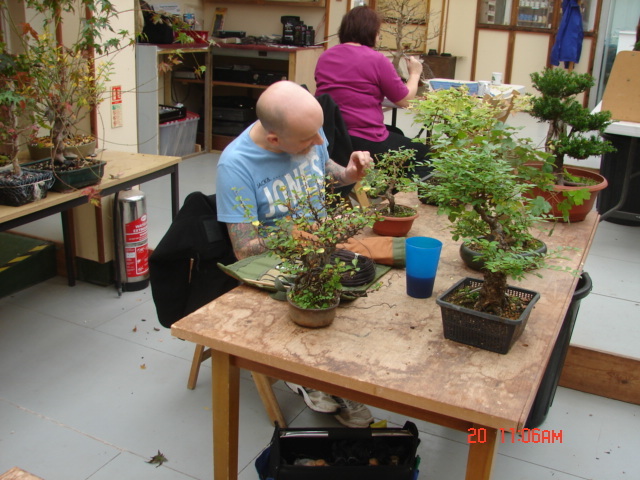 Angela brought along a friend who, despite not being interested in bonsai was still persuaded to help out with a bit of pruning. With Kate still busy on the table behind them. 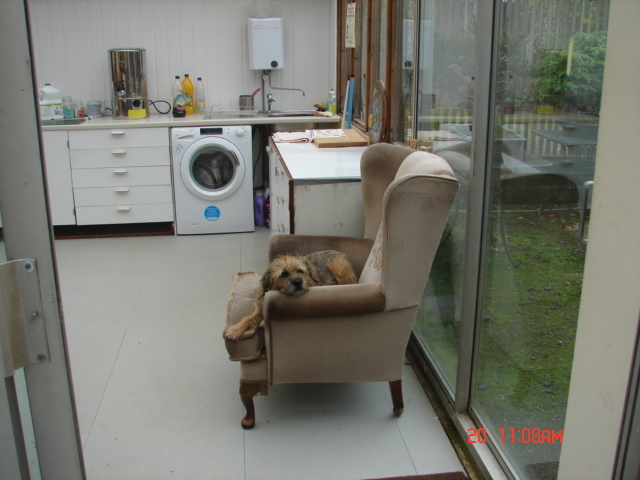 Caz’s Tyke found the whole thing just too boring and was contend to just settle down for a snooze in the comfy chair in the refreshment room. The tokonoma display for yesterday’s event. 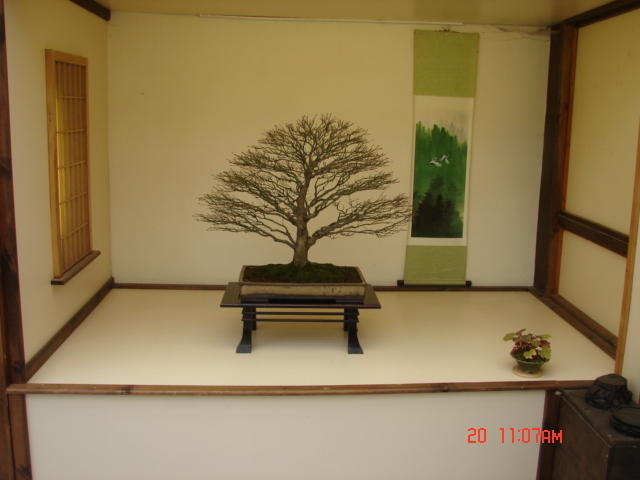 The feature tree was an ex Caz Kashima maple in a rather nice Gordon Duffet pot. 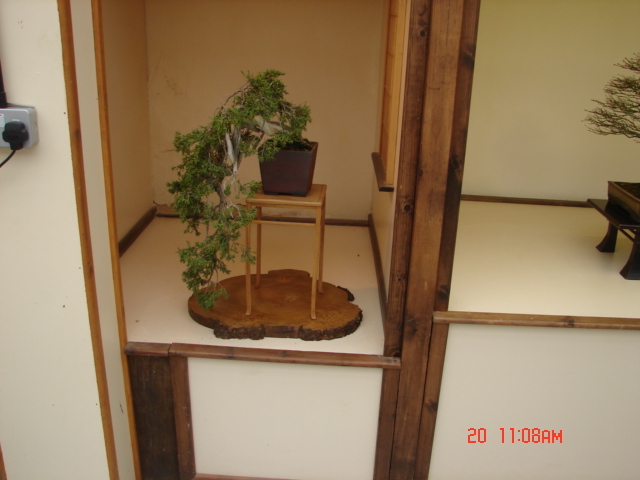 In the side alcove a potentially very nice Sabina juniper ready for a refinement styling. 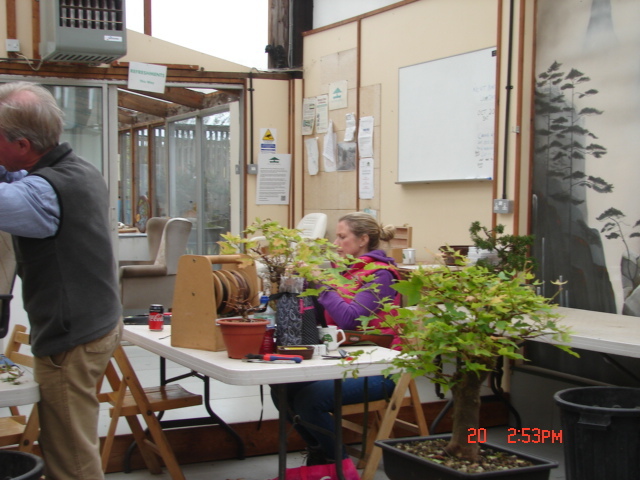 Thanks again to Peter for taking all the photos, to Caz and Scott for their help and to all the participants for supporting what we do here at Willowbog Bonsai. 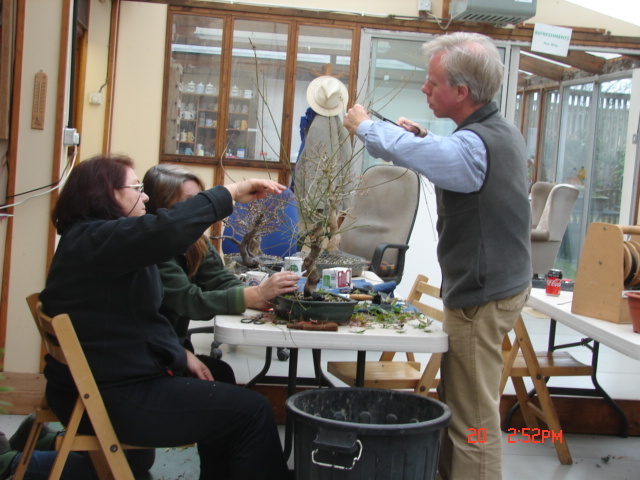 Next workshop here is November the 10th with a day focusing on deadwood in bonsai design, followed by November’s monthly workshop on the 17th. Contact us if you would like to participate, email, willowbog@live.co.uk or phone 01434681217.